Most of my Garden Beds in 2017 Garden Plan produces 3 batches of vegetables during one season. This Raised Bed is one of the exceptions. This Bed only holds Garlic and later a quick Spinach batch before it's time to prepare next years crops: Jerusalem Artichokes/Sunchokes. I have experimented a bit with Garlic companions (grew them with Wild Strawberries last season), but have decided to do a plain Garlic Bed this year. One of the reasons is that I find nutrients a bit tricky. I usually don't add grass clippings to Garlic, since they don't seem to like it as much as my other vegetables. Spinach is a quick second batch. Jerusalem Artichokes comes next in the Crop Rotation plan. 3b = This bed is in the "Needs Less" Quarter in my Crop Rotation Plan. According to my planning, this will be the Jerusalem Artichoke bed for next year, so I will plant Artichoke Bulbs in this bed after Garlic is done. This is a Bed that is started already previous autumn, so since this is the plan for 2017, I will start this bed in October 2016 (=very soon when I'm writing this). It's OK to start soon, since it's following the bed "2a Swiss Chard" that has been Empty since October according to 2017 Garden Plan. Add Chicken Manure to the Garlic Bed. I add approximately 300 grams of manure to a Raised Bed that is 80x120 centimeter. Plant Jerusalem Artichoke Bulbs for next growing season, cover with leaves and/or Grass Clippings or whatever organic material you have. And the Garlic Bed is started! I ordered the Garlic Heads a few weeks ago and have eagerly been waiting for the weather to get cold enough to plant them. I don't want them to start growing already and to show above ground when the weather gets freezing, so I've been waiting for temperatures around a few degrees Celsius. Growing Garlic is very rewarding. Minimum work, great to use and easy to store all year if you need to. I've dedicated one full Raised Bed to Garlic. I'd love to grow more Garlic, but this will still give me plenty of Garlic to use fresh and to store for Autumn and Winter. This is the Raised Bed that will be dedicated for Garlic. It has an automatic watering system (drip system), but it is turned off already which is good for Garlic. The autumns are pretty rainy here and I don´t want them to decompose due to overwatering or rainy weather. Before I start planting I add Chicken Manure to the Raised Bed. 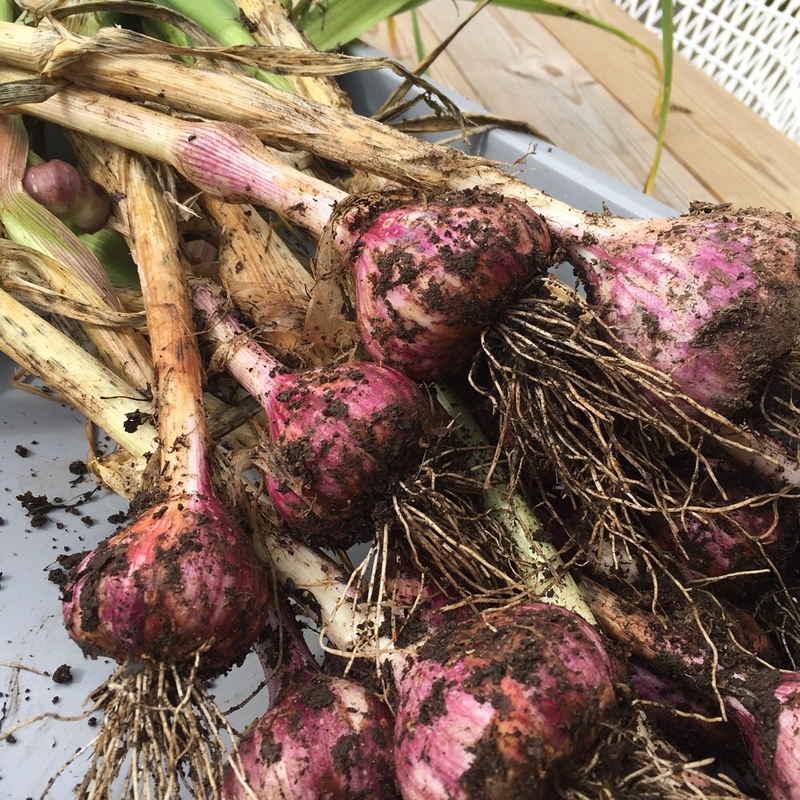 As long as I add nutrients when I plant, the Garlic Bulbs are usually growing fine during the rest of the season and only need a little bit of nutrients added later when the spring comes. Chicken Manure pellets are concentrated and it's easy to overdose (it doesn't look that much..). So I use my Garden Scale to make sure that I don't add to much. 300 grams is good for one Raised Bed that is 120x80 cm. Then I simply Place the Garlic Cloves in the Raised Bed like this, and push them ~10 cm into the soil. Finally I cover the Bed with Leaves (no need for Grass Clippings when I grow Garlic) and let it rest over the Winter. I planted my Garlic quite late in the Autumn and thought that my late planting would make sure that the Garlic Cloves would rest under ground all Winter and safely sprout in the Spring. I noticed today that some of the planted Garlic has started to sprout already during the Autumn and are now showing above the leaf mulch. The poor Garlic Sprouts look freezing in the Winter cold. It's better if they rest all spring and don't start growing until spring, but they are usually fine even though they start growing in the Autumn. Fingers crossed. What do you companion plant with the garlic? And, have you found the companions have improved/helped each other? nige wrote: What do you companion plant with the garlic? And, have you found the companions have improved/helped each other? I sometimes grow something between the Garlic Plants, it can be anything with shallow roots like Spinach, Lettuce of any kind (usually Little Gem) or Rocket. These seeds can be started outdoors, or indoors and planted between the Garlic as the plants are a few inches high. Since I want to give the Garlic enough room to grow I do pick Spinach/Lettuce quite small. However it's good to have something small in between to keep Weeds away and to fully use the space. I have experimented a bit with companions, but have mostly tried Garlic as the secondary crop to repell bugs from strawberries. That might have been good for the Strawberries (hard to tell) but I never got great Garlic that way (tried it for at least 2 seasons). I've read that Garlic should NOT be with Sugar Snap Peas or other Peas but I have never tried that to validate..
What's your experience on Garlic and companions? The Garlic Sprouts are still going strong even with more Snow. Snow has melted, spring is here, and Garlic is growing. I have two varieties of Garlic in this Raised Bed. The early Garlic variety is growing rapidly right now. The late Garlic is still resting below the covering leaves. Garlic update. Looking good! I will add grass clippings this weekend. That sounds reasonably. London should be a few weeks ahead of us. When do you plan to start harvesting? I will add grass clippings today or tomorrow to give them an extra rush before harvest. Garlic bed. I will for sure have more of them next season. Only thing depressive about them is that they require absolutely no care once they are in the ground. Just some grass clippings during the season..
Garlic is harvested, and I'm happy with the result!